Army may be able to serve its interests by keeping political parties weak, but it does so at the expense of Pakistan’s capacity to govern itself. 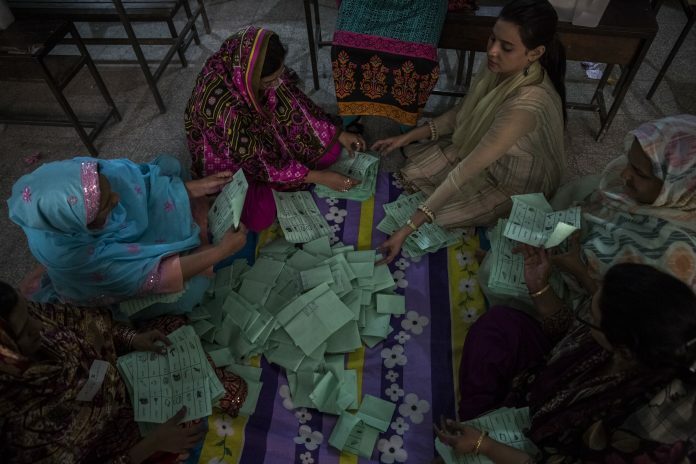 Ten years after its last military dictatorship ended, Pakistan is holding its third general election on schedule, but the Pakistan Army’s decades-long war on political parties continues. The 654,000-strong Pakistan Army, the sixth-largest force in the world, is at once highly professional and utterly devoid of the belief in civilian supremacy. Generals have been at the helm of government for 32 out of the 71 years of the country’s history. The Pakistani Army views popular parties and leaders as political rivals. Generals have rigged elections and overthrown and even hanged elected prime ministers. In addition to direct interventions through hard coups, the army regularly conducts soft coups. When it is unable to takeover, it intervenes indirectly to assert its authority. Originally, the army conducted soft coups through presidential dismissals of governments under Article 58(2) (b), which was struck down in 1997 by the Nawaz Sharif government. Since then, the army has engineered street protests and judicial dismissals to destabilise governing parties. In the 1980s, the army encouraged the formation and rise of Muttahida Qaumi Movement (MQM) to undermine the support for the Pakistan Peoples Party (PPP) in Sindh. In the 1990 election, the army dispersed Rs 140 million (or Rs 14 crore) to support parties and politicians, including Nawaz Sharif, to defeat the PPP. This time, the army has engineered defections in the popular Pakistan Muslim League (Nawaz) or PML(N). Under its watch, the campaign of the PPP has been disrupted and new charges of money laundering have been levelled against the party. News groups and journalists have been openly threatened for questioning the army’s actions. And, the army is majorly involved in administering the 25 July election. This practice has produced three damaging effects. First, they produce a class of military dependent democrats. Opposition politicians develop a military dependency to find a shortcut to political power, instead of waiting for the next election. Encouraged by the army, Imran Khan, the leader of Pakistan Tehreek-e-Insaf (PTI), led a protest movement against the Nawaz government in 2014. Nawaz himself enthusiastically supported the army’s dismissals of Benazir Bhutto’s governments in the 1990s, and Benazir returned the favour each time Nawaz’s governments were sent packing. Imran, said to be the army’s favoured candidate, has rejected the criticism against army intervention in the current election. The army’s interference creates a perverse process through which politicians act to hurt their long-term interests for short-term gains. Second, the army has developed a “minus one” formula through which major parties, which the army does not trust, are being rid of their popular leaders. Altaf Hussain (MQM) was found guilty of treason, and Nawaz (PML-N) was disqualified from politics by the Supreme Court for being corrupt. Most political parties in the region are leader-centric organisations, and decapitation in such structures encourages political factionalisation. The army’s immediate objective is that defections will weaken Nawaz’s PML(N), which it does not want to see return to power. Third, the political vacuum created by the weakening of popular parties enables the growth in the street power and influence of Islamist groups, including violent ones. Since the military relies on these groups for protest politics at home and fighting insurgencies abroad, the army treats them as allies. A coalition of six Islamist parties won elections in 2002 in two provinces — Khyber Pakhtunkhwa and Baluchistan – because of army support, which helped rig the elections. Again, the army backed religious parties in the 2008 elections. In the current election, the Milli Muslim League party loyal to Hafiz Saeed, Tahir ul-Qadri’s Pakistan Awami Tehreek, and Khadim Hussain Rizvi’s Tehreek-e-Labbaik are among the outfits and militants who stand to benefit from the army’s mainstreaming policy, which aims to introduce extremist outfits to electoral politics. Surprisingly, despite being on terror-watch lists, militants have been allowed by the Election Commission to contest the polls. On their own, these parties have limited influence, but strengthened by the army, they find it easier to bully already weakened mainstream parties. Across the world, Barbara Geddes tells us, 60 per cent military governments either create a political party or ally with one. That the army, as the institution in charge of the country, needs a political party to navigate Pakistan’s contentious politics is not lost on the generals. The emergence of king’s parties under military dictatorships testifies to this fact. General Ayub Khan, the country’s first military dictator, denounced parties for most of his tenure but eventually joined a political party. Pervez Musharraf, the last military dictator, had to cobble together a party to run a government. Today, exerting control from behind the scenes, the army’s fundamental suspicion of a popular political party continues to guide its behaviour. Short of taking over through a hard coup, army generals are then obliged to curtail the popularity of mainstream parties and destabilise politics. This process is likely to continue irrespective of the outcome of the elections. Besides fighting overt and covert wars outside the country, at home, Pakistani generals have been at war with political parties for decades. The current election, in this sense, represents the continuation of a longstanding process. The army may be able to serve its own interests by keeping parties weak, but it does this at the expense of Pakistan’s capacity to govern itself. The author is an Associate Professor of political science at University of California-Santa Barbara.